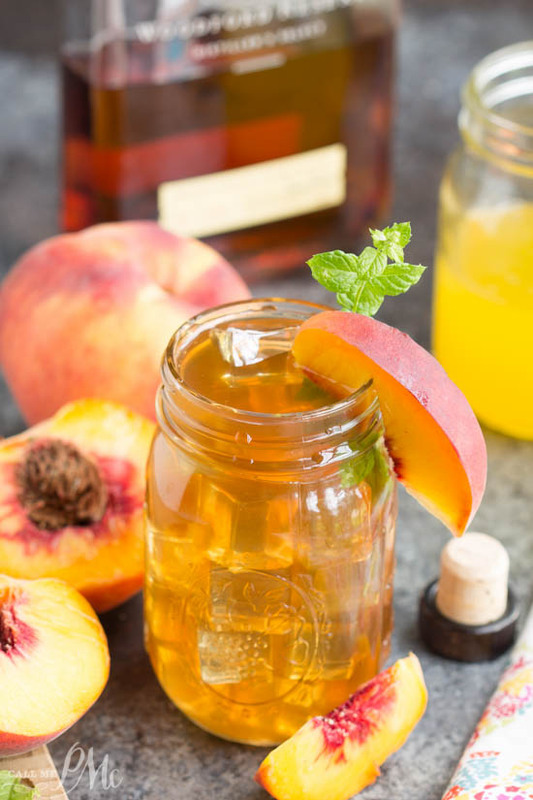 Bourbon Peach Tea Cocktail southern inspired flavors of bourbon and peaches. Turn any party into a celebration with this fun and easy drink! It’s National Bourbon Heritage Month! Did you know? It just seems fitting that September gets this honor, just in time for cooler weather and football season. I was inspired to make this drink recipe after we had cocktails at Forklift. They have very creative and awesome tasting cocktails. 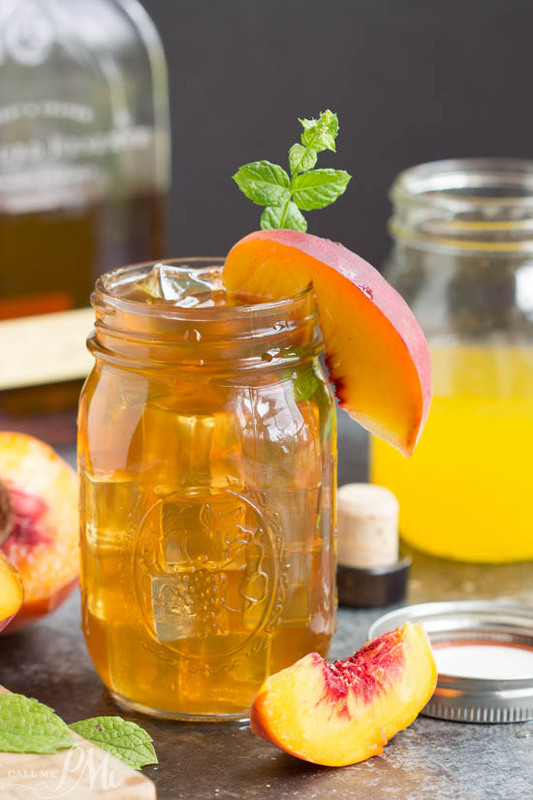 A cocktail with bourbon, sweet tea, and peaches perfect for celebrating the South and National Bourbon Heritage Month. Goodness, this cocktail recipe is delicious! So delicious, in fact, you’ll be making it over and over. Bourbon is Hubs liquid weakness. I knew he’d love this cocktail. I tested it early one day when he was at work. When I had the proportions just right, I text him a picture of it. Needless to say, he came home early that day to test it for himself. He gave it two thumbs up. He also sent a photo of it to all his best buddies bragging about how good it was. That was all the confirmation I needed that this is a winning recipe! The process for this cocktail was simple. I first made the tea and refrigerated it. Then, I made a peach simple syrup to incorporate the peach flavor in it. I strained the simple syrup to remove the peach pulp. This was my preference and you can skip straining if desired. 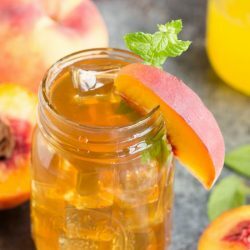 You can combine the tea and peach simple syrup now if you prefer. I did not since everyone has a different preference of sweetness in their drinks. The ratio I like best for this drink is 1/4 peach simple syrup, 1/4 bourbon, and 1/2 tea and ice. Make it to your liking. As well, I used Woodford Reserve Bourbon. It has a smooth, clean taste and smooth finish. It’s actually really good all by itself and extra good mixed in this Bourbon Peach Tea Cocktail. 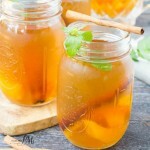 Bourbon Peach Tea Cocktail southern inspired flavors of bourbon and peaches. Turn any party into a celebration with this fun and easy drink. You can make a pitcher of these or make them one at a time. Prepare tea. Boil 8 cups water in a pan on the stove. Remove pan from heat and place tea bags in water. Allow to steep 5 minutes. Discard bags after 5 minutes and refrigerate tea to cool. Prepare simple syrup. Boil 3/4 cup sugar, 3/4 cup water, and pureed peaches in a small pan on the stove for 1 minute. Set aside to cool. Make cocktail. 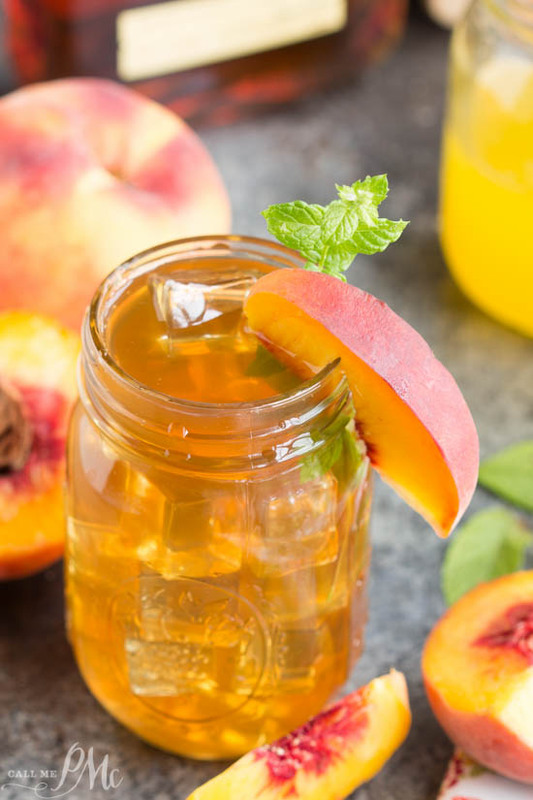 Fill glass 1/4 full with peach simple syrup, 1/4 full with bourbon, add ice and tea to fill glass. Stir. Enjoy. Um… yes, please! Sounds delicious!